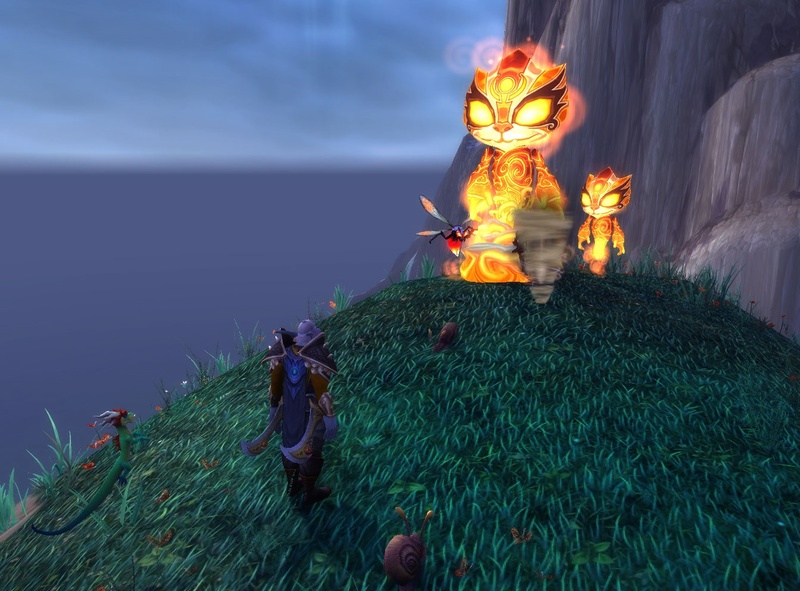 Fortunately I did some of the groundwork for this post back with the WoW Legion release. So nothing dramatic there, just a clarification without much information. That bodes well for the expansion. Of course, you have to have some perspective when looking at that list. Back in 2004 people had to go buy a physical box to play World of Warcraft and it has only been over the years that the process has become mostly a digital download experience. But back then even that 240K number set a record for single day sales. That number could have been bigger, but they effectively ran out of copies. At BlizzCon they told the tale of the truck load of collector’s editions meant for employees being diverted to the retail channel because the game had sold out. And that was US sales only, as it didn’t expand to the rest of the world until later. The Burning Crusade number is probably the most impressive on the list, since it is made up of people who went out to a store and bought a physical copy on day one. I went down to Fry’s on launch day… not at midnight for the launch party event… that used to be a thing back in the day… but closer to noon, to find pallets of the expansion out in the front of the store. Blizzard was not going to run short like they did with the initial launch. The cashier told me that people had been lined up outside the store for a copy earlier, so it was a pretty big deal. I think the last time I went to the store to buy an expansion was for Wrath of the Lich King. It has either been digital or Amazon discounted pre-orders since then. WotLK was also a big seller considering how much of it was physical boxes. And then there is Mists of Pandaria in the middle there, which they extended out to the first week of sales because it had to fight against both the sense of betrayal that some felt after Cataclysm and the lightweight perception that people had about it because it featured Pokemon-like pet battles and pandas as a race. It turned out to be a fine expansion, but it had some work to do to overcome that. I didn’t buy a copy until almost a year after it launched. But there were reasons to buy the expansion early, aside from the usual max level character boost (and mounts and pets if you bought the digital deluxe version). 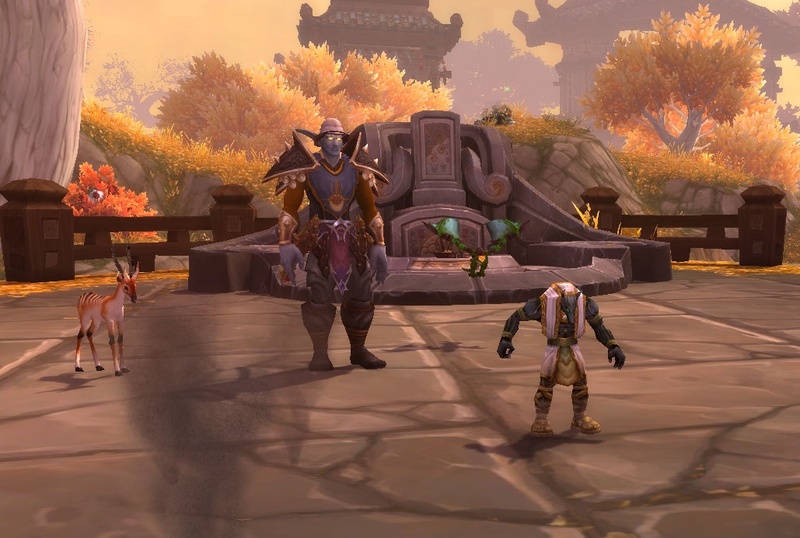 There were four allied races to unlock (for which we received four more character slots per server) and level up, with special transmog gear if you hit level cap with them. So, as a “giving people something to do” option it had some additional pull relative to past expansions. And even that was only worth an additional 100,000 sales I guess. The real number we’d all like to know, how many people are actually subscribed to World of Warcraft, remains hidden. Once a staple of the Acitivision-Blizzard quarterly reports, they have kept it hidden since the dark days of late Draenor, when the number dropped to 2006 levels. I suspect that if the subscriber base passed 13 million they would issue a press release, but the days of being able to track that quarter by quarter… or even pick out WoW‘s revenue from the financial statements… are long gone. The irony of being a public company; they are required to report important data, but they get to decide what is important. We will see how Battle for Azeroth does in the longer term. A lot of people are very happy with the open world story and quest lines and the look of things in general. But there is still the whole question of Sylvanas, a story line that upset some people in the pre-launch events. (#notmyhorde) And then there are the recycled bits from WoW Legion that pop up pretty quickly. Those aren’t bad, but they aren’t new either. Blizzard has had time to learn how to keep people engaged with an expansion. They did well enough with WoW Legion, even if they did open up the Battle for Azeroth pre-orders seven months before it was done. They will get to show us what else they have learned I suppose. This entry was posted in Blizzard, entertainment, World of Warcraft and tagged Battle for Azeroth, Cataclysm, Mists of Pandaria, The Burning Crusade, Warlords of Draenor, WoW Legion, Wrath of the Lich King on August 23, 2018 by Wilhelm Arcturus. There is always a desire to rate and rank things, to quantify things down to a simple calculation. Sure, you wrote a nice 2,500 review of that game, but how many stars did you give it? What is the Meta Critic score. And I am not immune to such things. I can ramble on for hundreds of words about something, how I feel about it, what I liked and what bothered me, but sometimes I’d like a nice objective measure of my real reaction. 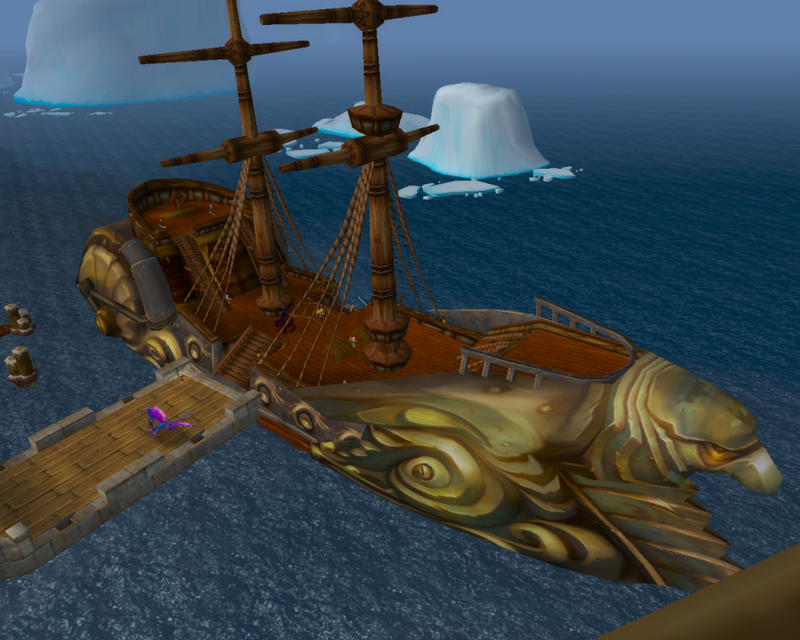 Which brings us to World of Warcraft expansions. I had this idea rolling around in my head and then Syp moved me to action by essentially praising what I found to be one of the worst aspects of the first WoW expansion, The Burning Crusade. I find expansions problematic in general. They must change the game and, in doing so, alienate some segment of the game’s population. They seek to extend the support of the fan base yet risk driving it away because every horrible feature, no matter how seemingly universally reviled, is somebody’s favorite. So when an expansion makes something better it inevitably wrecks the game for somebody. I’ve long said, only semi-sarcastically, that EverQuest: The Ruins of Kunark was the only “good” expansion, mostly because it expanded Norrath without changing it too much. And yet I am always at least somewhat enthusiastic for expansions, so I am even at war with myself over the idea. Vanilla can’t really be ranked in that list, it is more of a baseline, and WoW Legion is still active and I am still playing it, so the jury remains out. But I do wonder how much of an effect distance in time has on that ranking. If it wasn’t for a peeve of mine about quests in TBC it might actually contend for first spot. I mean, I loved the dungeons, there were plenty of them and, at the time, that was more important than a lot of other things. So I started fishing around for a way to quantify my activities in each expansion. Ideally I would be able to extract something like total play time or number of quests or number of dailies or number of dungeons run while each was the current live expansion. This is more a measure of how easy it was to level up rather than an indicator of enjoyment. Plus, WoD started the trend of giving players a level boost and ended on the pre-launch event for WoW Legion where I managed to get two character to max level. So I fished around some more and settled upon factions. More specifically, how may factions from a given expansion did I end up getting to exalted status? It is a decent measure of how long I stuck with a given expansion and it is something I tend to do with a single character. Of course, there are problems with that measurement. To start with, not all expansions have the same, or even comparable, numbers of factions. And there there is the question as to which factions should really count? I put “main” in apologetic quotes above for a reason. I somewhat arbitrarily decided individuals in Mists of Pandaria should not count, nor should the Sholazar Basin factions in Wrath of the Lich King. If I add those in MoP goes to 63% and WotLK goes to 61%. Since that keeps the ranking the same I dismissed that for the moment. Going the other direction, I might argue that the sub-factions of Alliance Vanguard in WotLK ought not to count the same way the Sholazar Basin factions didn’t count, which would give the expansion an 86% score, putting it on top. And then there is the question of which factions did I get to exalted in one expansion AFTER a later expansion appeared. Things get ugly for TBC with that, since I did at least three of those factions long after the fact, and even uglier for Cataclysm, which drops to zero. This is the reason I cannot rate Vanilla, I am pretty sure I only had one or two factions to exalted at the most during the reign of the original game, and maybe not even that. The Argent Tournament in WotLK got me to exalted on most of the main alliance factions Also, there are a those wacky factions, like the Bloodsail Buccaneers, or raid only factions, like the Brood of Nozdormu, that I was never going to crack. And this brings in a side issue, which is the expectations set by the previous state of the game. After Vanilla my expectations for TBC were pretty high. They were met on the dungeon experience side of things, but were dashed by how Blizz decided questing should be handled. And don’t get me started on ugly equipment or the introduction of some really dull daily quests. So my expectations were more modest for WotLK. Then came Cataclysm, the expansion I spent the least amount of time playing. That set expectations so low that I punted on Mists of Pandaria until it had been out for a year, then found it to be a really solid expansion. But with only 5 level boost in the level cap you could get to dailies and follow on items like playing with your farm or doing fishing quest pretty quickly. That realization, along with the return to TBC vibe that Warlords of Draenor started with and the idea of housing, again set expectations high. The zones were fine, the dungeons good, but garrisons sucked the life out of things, seemingly having been designed to prove a comment that Blizz made long ago about why they didn’t want housing; they pulled people out of the world into their own little domains. To add to the list of things that this might measure, I should also consider what I got out of getting various faction standings to their current state. And over the course of all of this the game has changed, the market changed, and we have all changed. Goofy stuff that my daughter and I used to do, like wander far afield just to find a specific pet, have been replaced with other tasks. 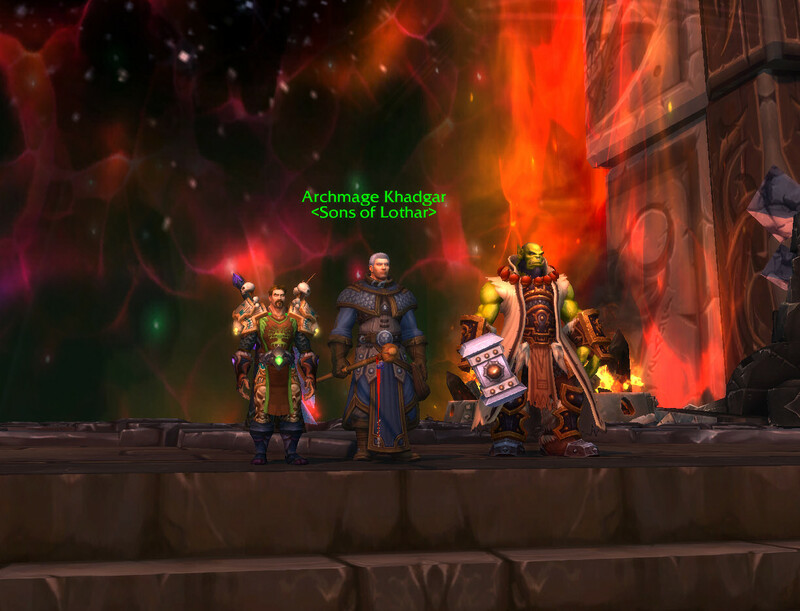 The instance group, with whom I ran though Vanilla, TBC, and WotLK, started to fall apart as the years went by, our lives changed, and our ability to stay up late diminished. So I have gone from a situation where the dungeon content has been supreme in my mind to being much more interested in solo items with some touristy group things via Dungeon Finder and LFR. That means my rankings are flawed in an even more esoteric fashion. So TBC and WotLK were good at dungeons when that was important to me while Cataclysm was not, while MoP was very good for solo when that was important to me while WoD wasn’t quite there. But WotLK was also very good for solo for me once the group tired, while the TBC solo content didn’t hold me very well once the group was done with dungeons. 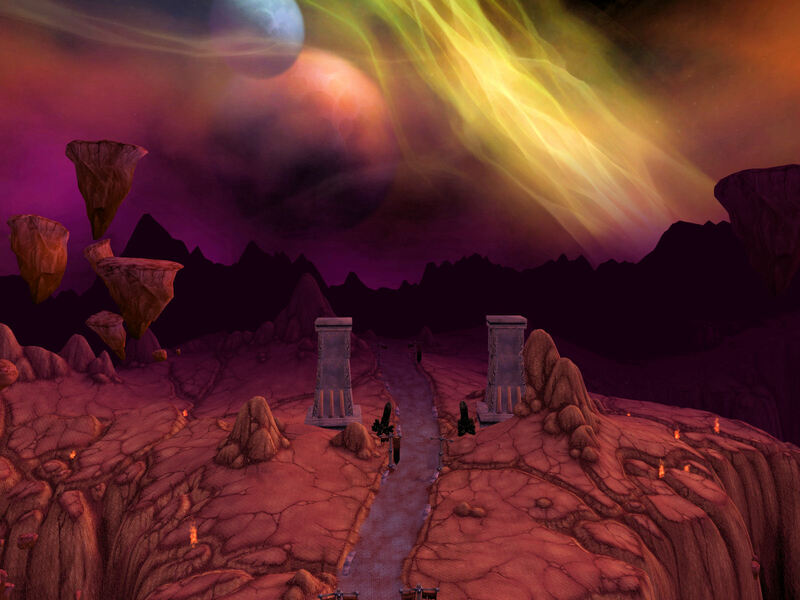 So maybe, in my own little world, I can admit that WotLK was a good expansion and put it alongside Ruins of Kunark. Basically, 1,500 words in, I think I have decided that I have wholeheartedly liked two MMO expansions, but I don’t expect you to agree with me. This entry was posted in entertainment, World of Warcraft and tagged Cataclysm, Mists of Pandaria, MMO Expansions, Rambling Detected, The Burning Crusade, Warlords of Draenor, Wrath of the Lich King on December 21, 2017 by Wilhelm Arcturus. 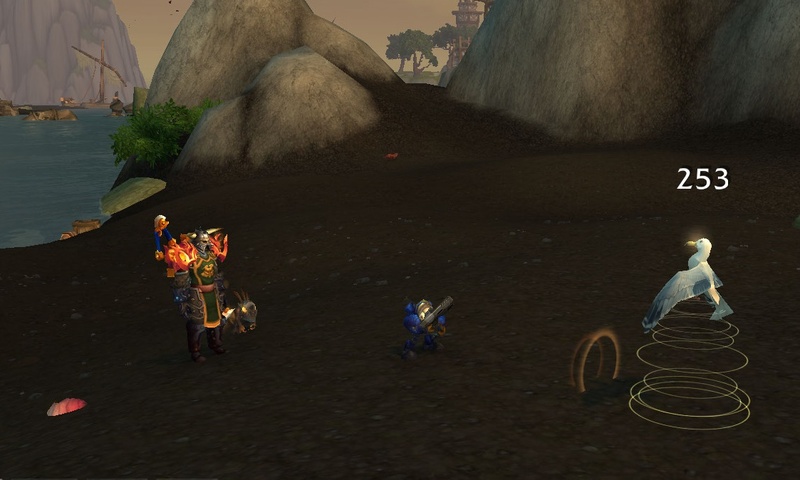 On coming back to World of Warcraft I was a bit bemused to find that one of my key pet battle addons, Pet Battle Teams, appeared to have broken again. I had run into problems with it before, when Blizz changed the name of the pets window in the game, so I checked on that. But that did not appear to be the problem. So I setup my base catching team, the Terrible Turnip, Grunty, and Deathy, and continued to catch pets in the Broken Isles while I tried to get the addon straightened out. 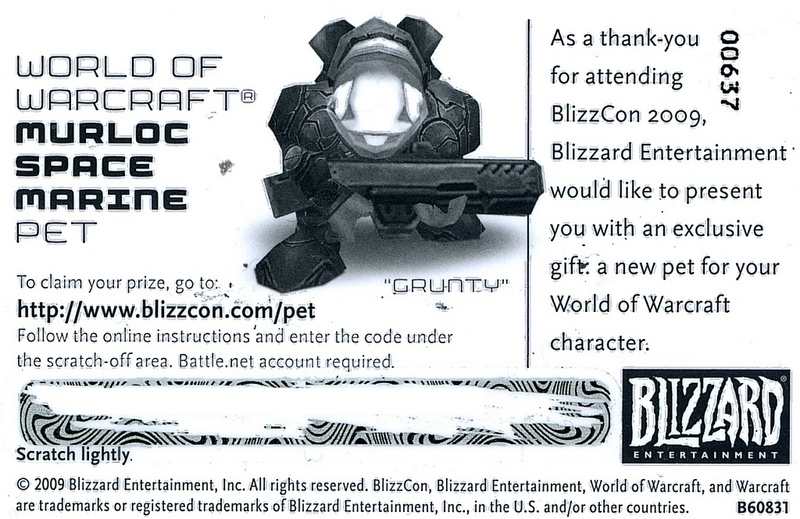 Grunty and Deathy are BlizzCon rewards and are two of my favorite pets. They are unique and a bit OP and work very well for a lot of my general needs. 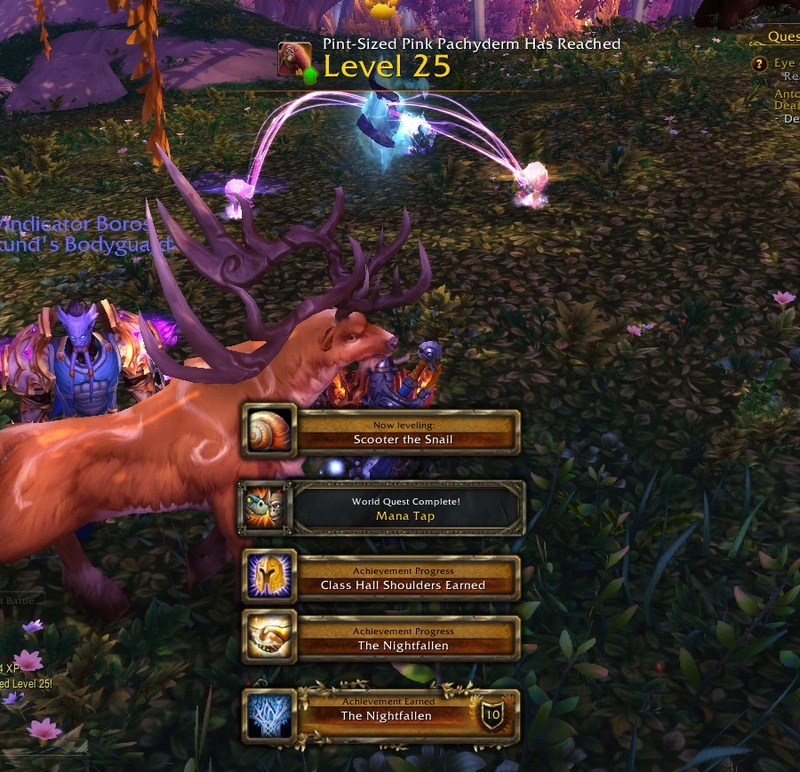 Grunty was the first battle pet of mine that hit level 25. I tinkered with Pet Battle Teams some more, tried uninstalling and re-installing the addon, and eventually removed all data and started from scratch. That last bit appeared to do the trick. Somewhere along the line my team data went out of date and when I came back to the latest version of the addon. That was a shame, as I had already set up teams to handle many of the trainers and challenges in the game. The problem I have with managing my pets is that with over 600 of them in my collection, including duplicates, finding the right pet for the right battle can be a challenge on its own. I like to have some set up for specific battles and other set up for opposing different pet types, like aquatic or flying. That at least puts a few of what I am often looking for quickly to hand. 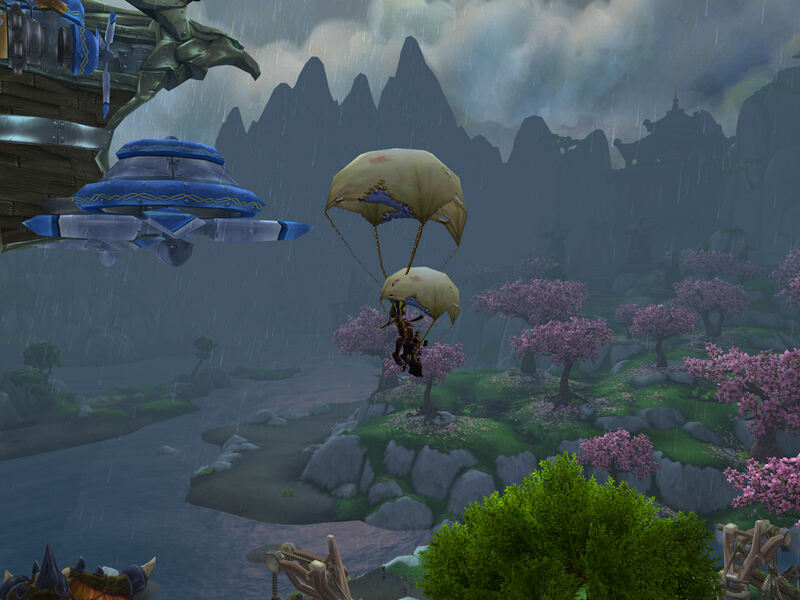 Of course, I should be working on flying in WoW Legion. But if I spend all my time doing that it will start to feel like a grind, so I do a bit of that every day, the look into other things. And with pet battles I actually have a lot of options. I have a bunch of nice pets I want to level up. I have the collections for various areas to finish. And then there is Pandaria. 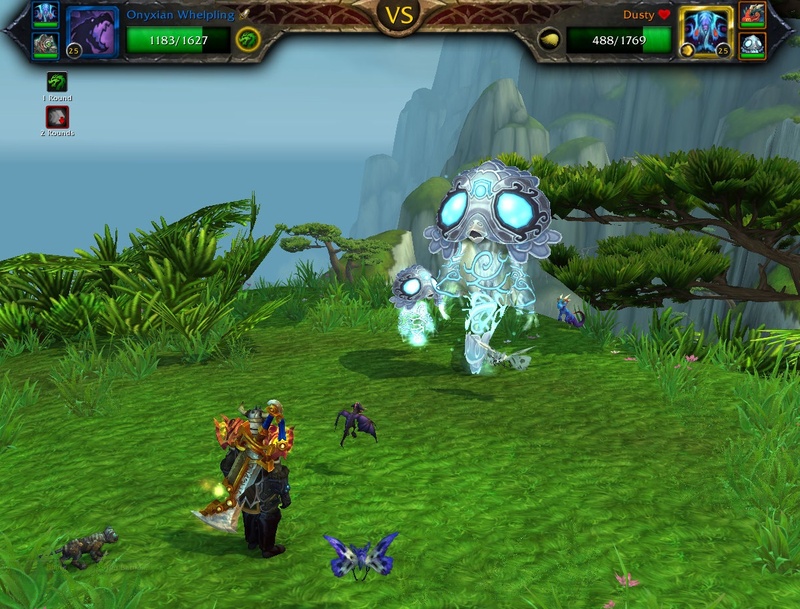 Pet battles came in with the Mists of Pandaria expansion, but that was the expansion I did not play at launch. Because of that, when I did finally join in on the expansion… and it turned out to be one of my favorites… I was way behind the curve when it came to pets. I had a bunch of pets, but they were all level 1. 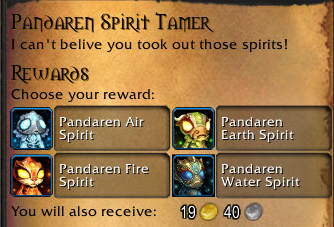 So I wasn’t going to be challenging the master trainers in Pandaria. 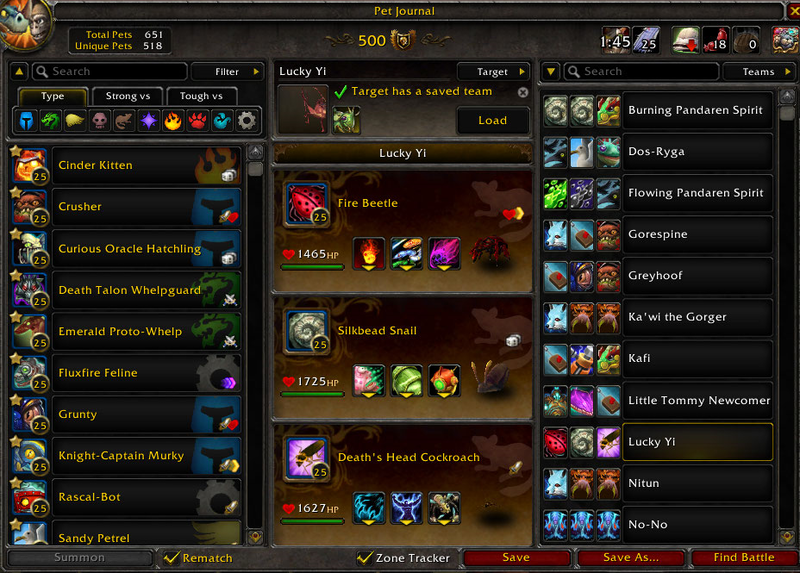 So, for me, pet battles really started in earnest with Warlords of Draenor. 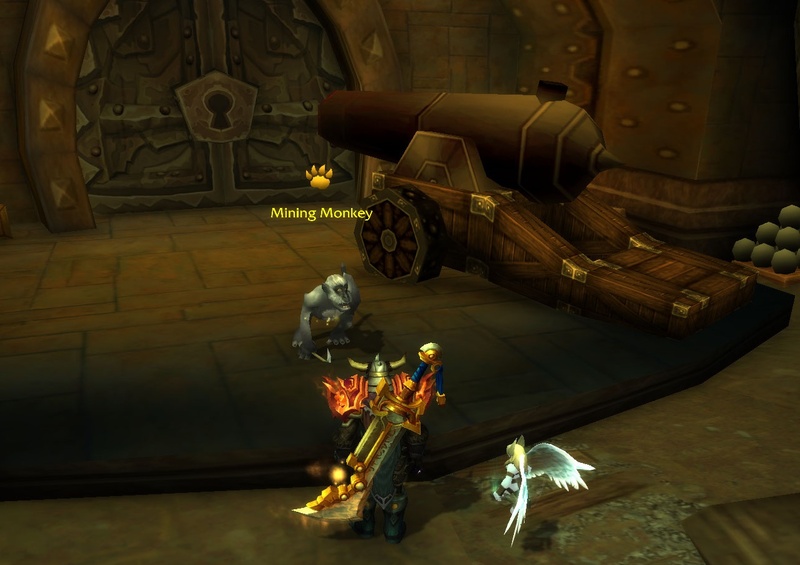 I had to work to build up a team to unlock the menagerie in my garrison. While I have a number of negative comments about garrisons in Draenor, the menagerie was not something I would knock. 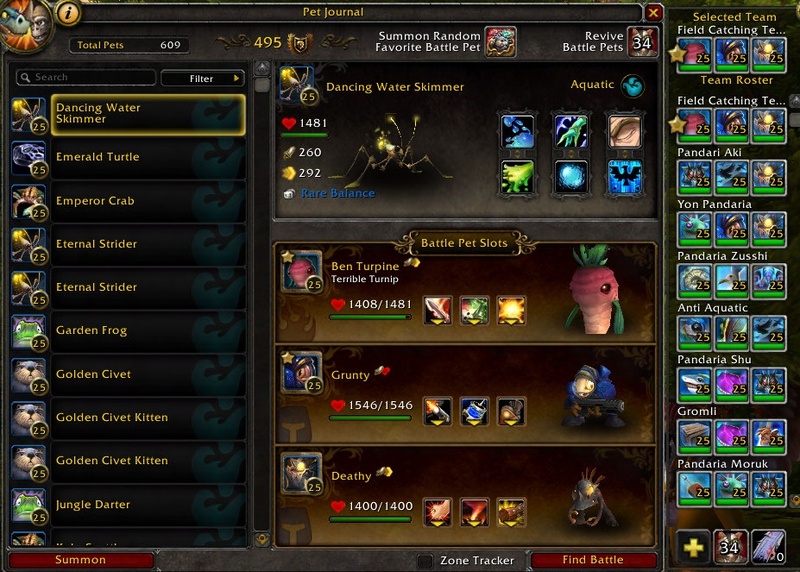 The menagerie became the cornerstone of my pet battle experience. Between that and Trainer Ashlei I was able to level up and improve my collection dramatically. As I wrote back in early 2015, my pet battle enthusiasm had been unleashed. 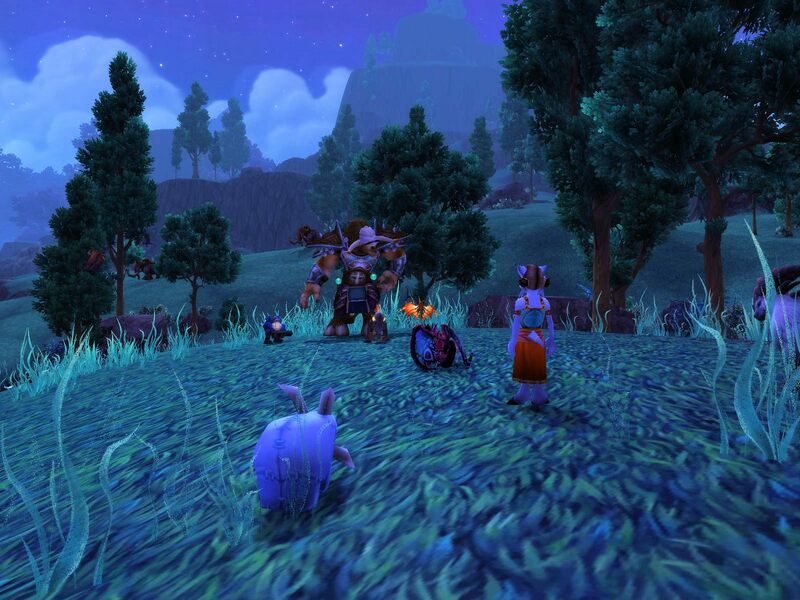 Now, running around the Broken Isles doing world quests, I was finding that pet battles were on the list of options. In building up teams for that I started to realize that I had a something of a collection going. 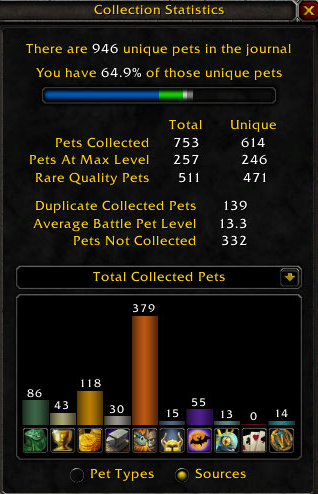 Checking my stats over at Warcraft Pets, I saw I had well over 100 max level pets. 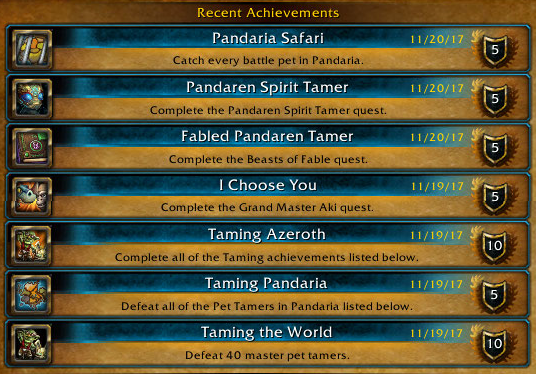 So I decided I might be ready to go back to Pandaria to face some of the trainer challenges there. I may have binged on it a bit. After a rough start I managed to get in the two beginning challenges for trainers there, racking up a number of achievements along the way. Getting those required some research. WoW Head has posts with basic information about each fight, which is a start. It is the comments where the real meat comes in about the sorts of teams that might be successful. However, it isn’t just copy the team and go at it… mostly because I almost never have the battle pets suggested. Literally I think all of my pet battle problems would be solved if only I had the Anubisath Idol pet, as it seems to feature heavily in successful teams. However, I don’t have him or a number of other favorites. So I looked at what had been successful to see if I can use those ideas with pets I actually have. I got a few on the first try, but most took a couple of runs to come to victory. Eventually I ended up at my last fight. Success there led me back to the quest giver. That both yielded a reward, a new pet, of course. That also opened up daily versions of the quests in order to get the pets I didn’t choose. So I have more battles ahead of me. 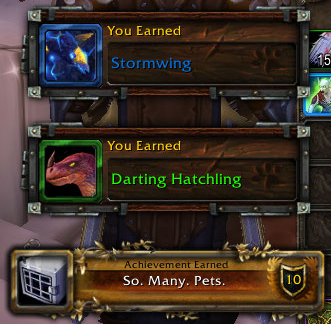 In addition, I still have a lot more pets to catch. 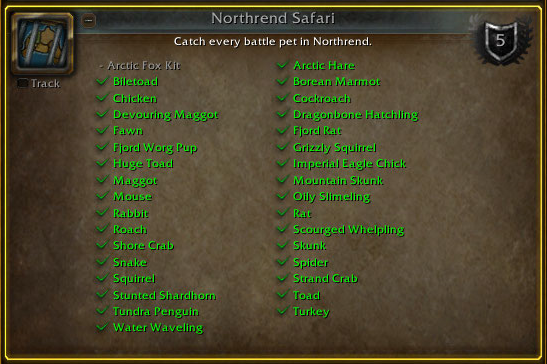 In some places just one pet awaits me, like the one I am missing in Northrend. In other areas I have to get there at the right time. And then there are the raiding with leashes pets. I have a couple of those, but there is a list still waiting for me, including the aforementioned Anubisath Idol. So much left to do… enough to keep me busy for a while I imagine. This entry was posted in entertainment, World of Warcraft and tagged Mists of Pandaria, Pet Battles, Warlords of Draenor on November 21, 2017 by Wilhelm Arcturus. Despite being critical of the so-called “game play” of garrison missions and Blizzard having nerfed garrison gold farming back to the stone age with the 7.0 patch back in early August, I still hit garrisons with Vikund and several alts every day. 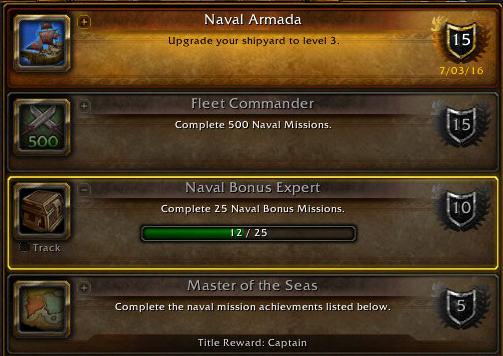 The naval bonus missions are the rare ones, so I check in daily to see if one has popped up, then run some missions anyway (including the one for 400 oil) because I might as well get the “Fleet Commander” achievement while I am there. But mainly I have been going back for garrison resources. After the 7.0 patch, Blizzard took away gold as a reward for many things… though you can still get occasional ilevel 655 or 670 items from missions that are worth… but boosted the garrison resource output. I imagine that this is to help alts and others showing up in the post-Draenor era build their garrisons. 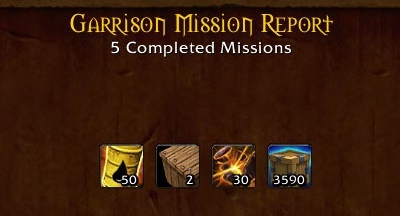 So all those follows with the extreme scavenger trait that I optimized for in order to boost gold returns on mission, they now return piles of garrison resources instead. 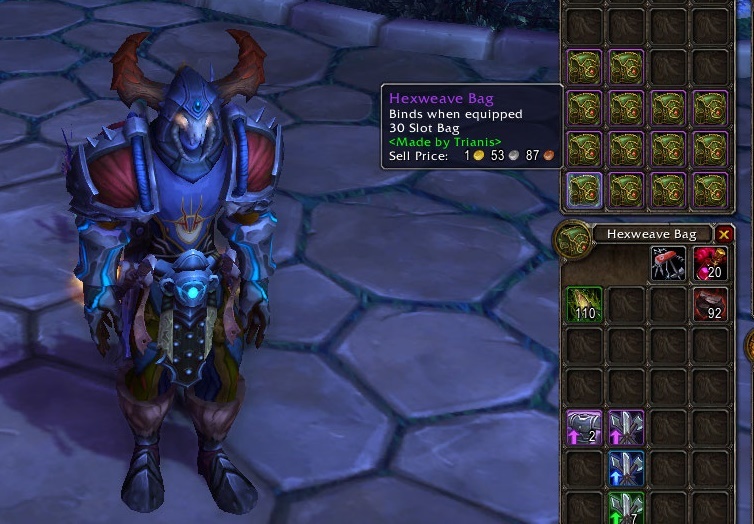 The salvage yard now hands out garrison resources with each box or bag you open as well. I am taking all of those garrison resources to the vendor at the trading post, which I have built on several of my alt garrisons as well, and but supplies for my tail who then turns them into hexweave bags. I save some of them for the auction house when the price is good, but my main goal is to outfit all of my characters, inventory and bank, with 30 slot bags. I figured that I might as well put all of those alts hanging about in their garrisons waiting for their turn in the Broken Isles to use. It is funny, at times, to see the array of bags that my characters have. There are plenty of 16 slot mageweave bags, along with a fair number of the old school, no-bind, 16 slot traveler’s backpack. I remember when getting one of those as a drop was a big deal. There are bags that were quest rewards and bag that were drops from old raids that I ran back and did once I was high enough level to solo them. I even have the Haris Pilton “Gigantique” from back in the Burning Crusade era. A 22 slot bag for 1,200 gold, a time when both 22 slots and 1,200 gold seemed like a lot. I did not, however, bother to buy the so-called “Portable Hole” bag from Haris Pilton, a Wrath of the Lich King era addition to her stock. It wasn’t because it was too expensive, though you can get a 30-slot hexweave bag for less these days, but because nearly seven years back it simply annoyed me that Blizzard decided to use that name for what is otherwise a rather modest sized bag. I’ve looked in a portable hole before, it holds more than 24 slots worth of stuff. This entry was posted in entertainment, World of Warcraft and tagged Garrisons, Warlords of Draenor on September 27, 2016 by Wilhelm Arcturus. WoW Legion launched, which almost requires that there be some celebratory press release in which Blizzard referred to itself in the third person. My guess is that they had that press release ready to go for a bit now, as they didn’t even bother to fill in the date before they posted it. I imagine they will fix that before the day is out, so here it is a screen shot for the record. So, for first day sales, WoW Legion ranks with… I don’t want to say “the best,” since its peers at that level are not my favorite expansions… past top sellers. Warlords of Draenor did just as well according to the Blizzard press release from its launch, which included a mention of exceeding 10 million subscribers, a mark that would soon drop precipitously. Mists of Pandaria, which in hindsight was a pretty good expansion, maybe my second favorite, and which held on to the player base admirably compare to WoD, had to go a full week to get to 2.7 million sales, which put it below every expansion save Burning Crusade. 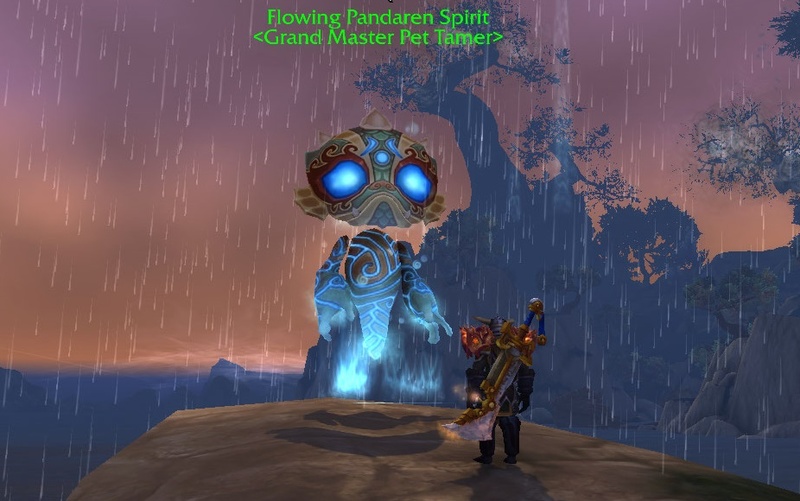 The pleading for a new expansion towards the end of Mists of Pandaria now seem almost quaint given the mass exodus from the game that came with WoD. Then there was Cataclysm, which I am going to say was probably the first point when digital sales made up a significant portion of the first day sales, setting a record as yet unbeaten, with 3.3 million sales. There were some good things in that expansion, but the destruction of the old world still stings. Then Wrath of the Lich King and Burning Crusade check in at 2.8 and 2.4 million units sold on the first day. That was back when Fry’s was open at midnight to sell you a copy and they had pallets of boxes out on the sales floor. That was the era of growth, which Cataclysm put paid to. And finally, just for completeness, there was World of Warcraft back in 2004, which sold 240,000 copies on the first day, which was a record at the time. No digital sales in that number I bet! So that is how the list stacks up. WoW Legion sold well enough, though judging from what I have seen… or not seen… on store shelves, it was almost all digital. (I was at Best Buy on Monday and they had a single standard edition, wrapped up protectively in an anti-theft device and sitting alone at the bottom of a shelf. No display. No signs. No big deal. How times have changed.) That likely means WoW Legion sold directly into the currently subscribed base in the US/EU. It would be interesting to know what the subscriber base jumped up to with the launch. I suspect that if it had passed 10 million, Blizz might have mentioned it. But maybe not, and we’ll likely never see a number to prove it either way. 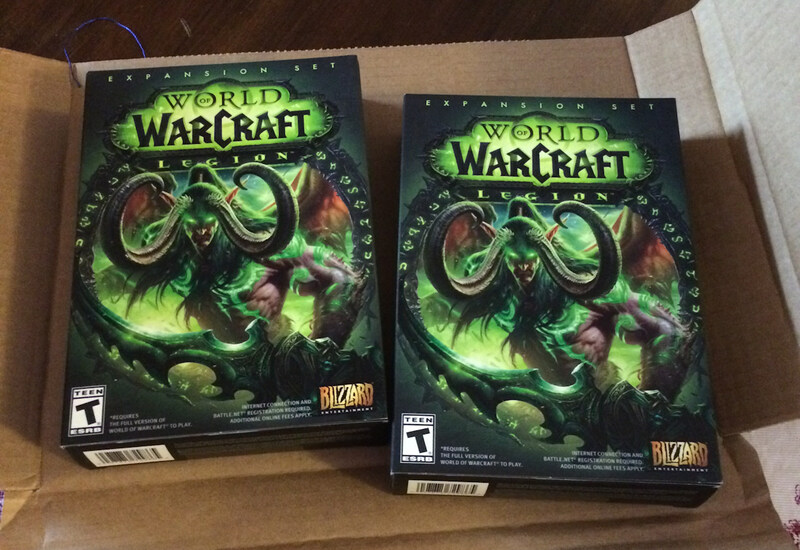 I will have to hang on to the two WoW Legion boxes we got at our house. Given the state of the retail channel for the expansion, those might be collectible in a few years. I mean, a DVD for WoW Legion? I am not sure why they even bother. The patcher had everything in place already. All I needed was the code off the label and I was upgraded and playing. Modern times. This entry was posted in entertainment, World of Warcraft and tagged Cataclysm, Mists of Pandaria, MMO Expansions, The Burning Crusade, Warlords of Draenor, WoW Legion, Wrath of the Lich King on September 8, 2016 by Wilhelm Arcturus.